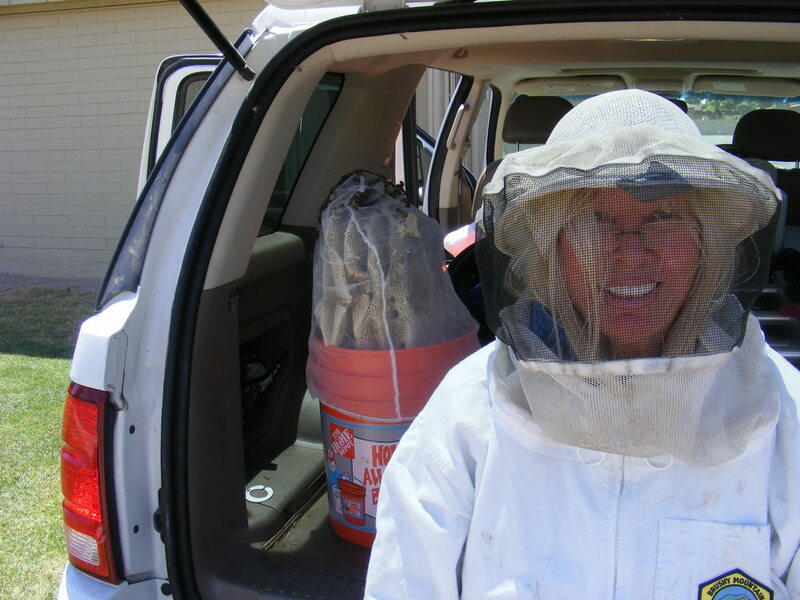 Should you find yourself needing the help of an accomplished local Beekeeper to safely remove Honey Bees feel free to call Michael Foster at 480-213-0178 ... I'm always happy to listen and discuss your needs and options. 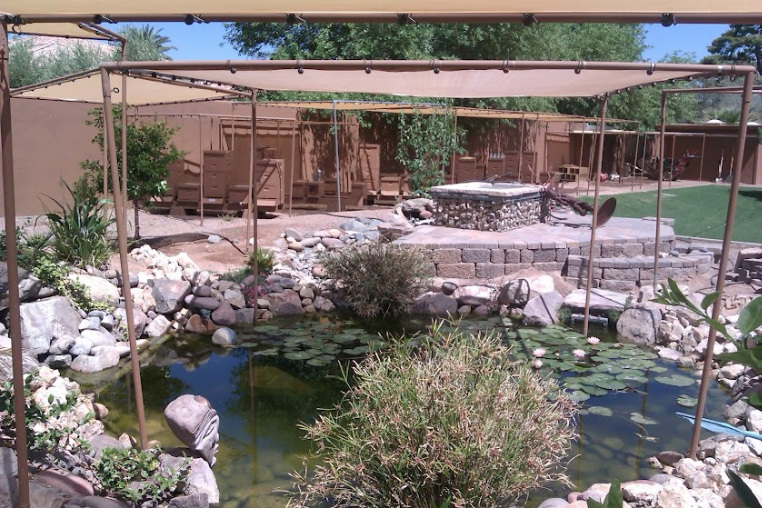 Thank you Diane – It is always nice to receive compliments on our contractors. Michael is great and always responds quickly! Thank you very much for your help in resolving the issue with Africanized bees located in the NAOS outside my property in the wash between 11596 E. Cottontail Lane and Lucille Petrucci's property at 11595 E. Christmas Cholla Drive. My lawn maintenance professional had been unable to mow as noise of his equipment aroused the bees, and I was also concerned about the safety of my dog. I called you on Friday, April 28th to tell you about this problem, and you said you would contact your bee professional. Michael Foster, owner of Bees Begone, came out that same day. That was a very pleasant surprise that he was here so quickly. He was professional and efficient. He explained these were not valuable honeybees, and said he would spray them. He did so immediately, and he texted me later in the day to confirm if the problem was completely resolved. I told him I thought so, but I had not gone too close to the area where the bees were, but told him I would take a closer check in the morning. He texted me again on Saturday to be sure the job was complete, which it was. I was very impressed with how quickly the issue was resolved. You have a great resource in Michael and BeesBegone. It had turned out I didn't need the service. Thanks Mr. Foster for being honest in your advice rather than lying to earn $$. If I hear of anyone needing your service I will refer them to you. Michael was very professional in his work. He explained the pros and cons of every option/solution and I was impressed by his work. He was inexpensive too compared to most others. I would highly recommend Michael Foster for any bee related treatment. this guy mike is the absolute BEST had a bee problem in my blue reycleing can and he came out the sameday and took care of it if you got bee's call him the best guy around mike thank you so much!!!!!.. Words are simply not adequate for how impressed I was when Michael Foster, the owner of BeesBegone performed a honey bee removal for us here at the Scottsdale 2000 Community Complex. The discovery of a bee hive in a grapefruit tree near one of the owner's condos was both delightful and disturbing. Having never seen a bee hive before it was really neat to watch them busily working to do whatever it is that bees do...to make honey. Their hive was beautifully positioned in the tree and it just looked like one of nature's natural wonders. Unfortunately, when the gardeners came to mow under the tree they became aggressive and removal was an absolute necessity. The homeowner who lived within a few feet of the tree was greatly distressed and quick action needed to be taken. We began to research bee removal in our area on the internet. There were many beekeepers listed who promised satisfactory results and we called several, all of whom described the africanized bees as aggressive and recommended extermination. 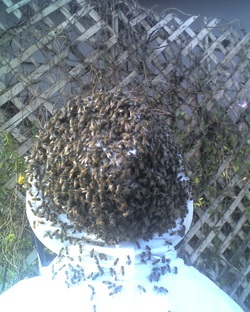 We had been hoping that a beekeeper could find a way to remove the hive and save the bees. It didn't seem possible. We decided to use the services of Michael Foster of BeesBegone for a couple of reasons. Even though he said he didn't think the bees could be saved, he came across as both professional and compassionate as he explained the nature of the africanized bee and how dangerous they could become when they set up residence in places such as ours. The second factor in hiring him was that he was less expensive than anyone else we spoke to and sensed our concerns for the safety of our resident who lived near the bees. I had no idea what a fantastic experience was ahead for me. He was right on time, calling ahead to let us know he was on his way. At the time I asked him if I could be around to watch the removal. He told me to put on a long sleeve shirt, jeans and shoes that covered my feet well. When he arrived he gave me a beekeeper's jacket with the hooded face guard to protect me from the bees if they got aggressive. He also told me what to do if they should become viscous. He put on his bee suit over his clothes and got right to work. The hive was approximately 18 inches high and a foot in diameter and centrally located in the tree. After he got on his ladder and inspected the hive he decided, much to my delight, to try to save the hive and bees. While I watched, fully protected, and took pictures of him in action, he did exactly that. He was able to remove the hive and live bees, with basically no damage to the tree. It was a story with a very happy ending as he put the hive and bees in the back of his vehicle to take home with him and to integrate into his own bee colony. I can't recommend Michael Foster of BeesBegone highly enough. Not only did he do what he said he would...when he would...and for the price he said he would charge...be he also proved to be professional who is also a friend of nature. Thank you, Michael, for such a great experience. Please feel free to have anyone who has any doubts give me a call. I will be more than happy to confirm my testimonial. 1. Any condition or place in populous areas that constitutes a breeding place for flies, rodents, mosquitoes and other insects that are capable of carrying and transmitting disease-causing organisms to any person or persons or any condition or place that constitutes a feral colony of honeybees that is not currently maintained by a beekeeper and that poses a health or safety hazard to the public. LOS ANGELES – Thousands of angry bees swarmed a man in a wheelchair, sending him and three others who came to his aid to the hospital in the Southern California city of Santa Ana. The attack also shut down a street and forced the evacuation of several businesses while beekeepers removed the hive, which was estimated to contain 60,000 bees. 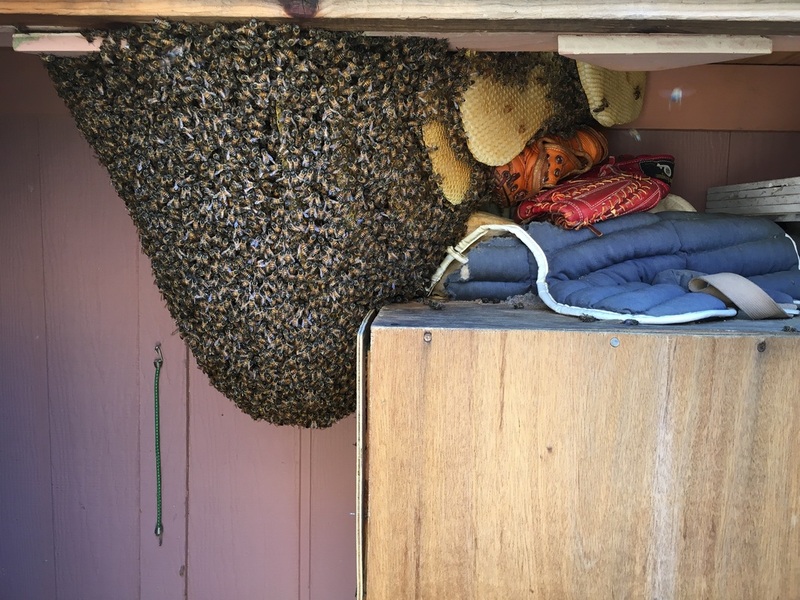 The trouble started at a storage yard when a man in a wheelchair apparently disturbed the hive, causing the bees to bombard him, Santa Ana fire Capt. Steven Snyder said. "He was attacked and stung over 60 times and had fallen out of the wheelchair and was yelling for help," Snyder said. The man's cries attracted the attention of three bystanders who ran to his aid. The bees were so aggressive that the three men had to retreat initially, but they dove back in and managed to pull the man to safety, Snyder said. The men were stung dozens of times during the "very impressive" rescue, he said. "They probably saved his life," Snyder said. All four men had difficulty breathing and suffered rashes, nausea and vomiting. They were taken to hospitals and at least two of the men were released Thursday night, Snyder said. He didn't know their conditions or if the man in the wheelchair was still hospitalized. No names were released, but Snyder estimated all four men were in their 40s. Two firefighters who responded to the scene also were stung. Snyder said DNA tests were planned to determine if the bees were Africanized because of their aggressive behavior. The bee attack wasn't the first to make headlines this week. On Wednesday, Africanized bees swarmed several farm animals and killed a 1,000-pound hog at a farm in Bisbee, Ariz. An 800-pound pregnant sow also was stung so many times that it went into a coma and lost its litter. In northern Arizona, a 49-year-old man remained hospitalized after authorities say he disturbed bees nesting under a cattle trough Sunday and was stung more than 1,000 times.